Goddess Durga is Hindu’s most devoted God. She is the goddess of Shakti who has contributed towards the justice of the Earth as well as Souls residing in heaven. Another name of Maa durga is Shri Durga Ambe Maa. This Yantra has been carved in silver as well as gold metal. Worshiping the same is done through the pronunciation of the Beej Mantra. During the Astami tithi as well as on Navaratri, if you can pronounce the particular mantra of Ma Durga and install the particular Yantra, it will provide you with wonderful results. The most powerful Yantra which is deliberately used for attaining all desires of people and conquering enemies is known as the Durga Yantra. Property as well as the wealth of a individual can be bestowed with the use of this Yantra. There will also be a special effect of the Yantra when you will be in a position to remove all the difficulties in your life. There might be various types of difficulties faced by people when dealings are diverse in wealth and property. But, after using the Durga Yantra, the scope would be broadened and all the obstacles in your way will be removed. You can even call the Yantra as the magic triangle of Indian Goddess Durga. If you really wish to have the blessing of Goddess Durga for gaining courage and victory in your life, Durga Yantra would be really beneficial. As per Hindu mythology, She is the supreme authority to be empowered with the divine power. This power has got a positive effect on our soul and our body. Even if she finds any women facing difficulty in Earth, she would be the supreme authority to become her savior. The rays produced from the Yantra would stimulate your mind with courage. A learned purohit or priest energise (pran prtaistha) the vedic yantras after chanting the mantra of the specific god or goddess 1 lakh 18 thousand times and the Homa of one hundred and eight mantras. Yantras are forwarded along with the Prasad of the energised deity. A native must set up the face of the Durga Yantra either at the Easter side or the Northern side in a fresh and holy manner in the table of lord. It must be assured that none should come in the contact of this yantra. One must clean this yantra with milk or rose water in the course of time. Water may be used for clean and for drying the yantra one must use pad. 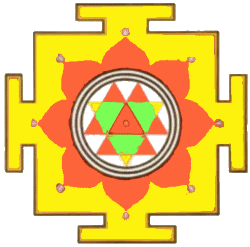 Draw rounded dots of the sandalwood stick on the 4 angle of this yantra in addition with the center. One must light up a diya with ghee lamp before the yantra. Fresh flowers and fruits should offer as Prasad. After that, focus and recite the mantra of this yantra that is “Katyayanaya Vidh Mahe Kanya Kumari Dhi Mahi Tanno Durgi Prachodayat” for twenty one times. One must keep in the mind that before the worship of Maa Durga one must purify oneself.